In my recent haul, you will have seen that I bought two L'Occitane body oils. 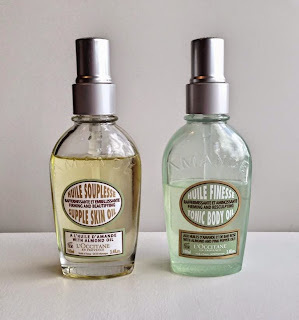 I have used a few bottles of the L'Occitane Almond Shower Oil before and always loved it and on my never-ending list of products to try was the L'Occitane Supple Skin Oil so I decided to try it in order to hydrate my skin and get it ready for summer! I also decided to buy L'Occitane Tonic Body Oil out of curiosity and thought I would give you a comparison review of them both today. On first inspection, you can see that the two oils are different colours. The Supple Skin Oil looks very like the shower oil - a golden, yellow colour and the Tonic Body Oil is a pale green. Both bottle contain 100ml. The Supple Skin Oil has a rich texture and a little goes a very long way. It aims to hydrate the skin for 48 hours and I can confirm that it achieves that aim. The first time that I used this, I couldn't stop stroking my skin because it was just so, so soft! The next day, it was still just as soft, as though I had just applied it. I used my shower oil in the bath and didn't re-apply the oil that day to test the 48 hour claim. I never, ever go a day without applying a lotion/oil (even if I am in hospital or very ill!) so this was a first for me but my skin definitely didn't suffer. For that reason, I think this would be perfect for people low on energy or time because you really only need to apply it three times a week, or possibly twice a week at a push. Both bottles come with pumps, which makes the whole process a lot faster. The Tonic Body Oil has a much lighter feel to it. It contains both almond and pink pepper oil. It leaves the skin feeling very refreshed and "light" if that makes sense. It also feels zingy - not like prickly heat, but a light, warming sensation on the skin that I really like. For this reason, I wouldn't use this product as night because it makes me feel more awake making it ideal for mornings. It absorbs more quickly than the Supple Skin Oil and you can dress immediately after application. This would be perfect for after an exercise glass or gym session. I don't know about the "toning" qualities of this oil but I have only been using it for about 2 weeks. I will keep you posted on that. I love both of these oils, for different reasons. When it comes to repurchasing, I don't know how I will decide! The Tonic Body Oil is probably more suitable for summer and Supple Skin Oil would be perfect for winter or when on a sun holiday & the skin is feeling a bit parched. They are quite pricey, but worth it for a treat or the would make a nice gift. Have you tried either of these oils or anything similar?